I wonder how many Canadian jazz musicians the average British follower of jazz could name, off the cuff, as it were: Oscar Peterson, obviously and, I trust, our ‘own’ Kenny Wheeler. Paul Bley perhaps. Maybe Jim Galloway and Renée Rosnes. Jane Bunnett? Fraser McPherson? Oliver Jones? Georgie Auld (real name John Altwerger) was born in Toronto … by now we are getting somewhat desparate. One striking thing is how many of these musicians moved away from Canada to make their names. It is hard for musicians who stayed and worked in Canada to make a reputation across this side of the Atlantic – they are overshadowed by the wealth of talent in the USA. Records on Canadian labels generally get inferior international distribution compared those on labels from the USA. Yet there has long been an impressive Canadian jazz scene – the Canadian jazz Archive online ( http://www.canadianjazzarchive.org/ ) is a good place to get some sense of it. The trumpeter Al Muirhead has for many years been a significant presence in the world of Canadian jazz, as an instrumentalist, composer and arranger. He was born in 1935 and was already playing professionally in his teens. He has had experience alongside a figure such as Dizzy Gillespie and yet (although appearing as a sideman on albums led by numerous other musicians) he didn’t make an album under his own name until 2014 (aptly calledIt’s About Time !) when he was 79 years young! It was followed by Oop! (his nickname is Ally Oop – jazzmen’s humour is much the same everywhere), in 2016 and by Northern Adventures – The Canada Sessions, Vol. 1 in 2017. When offered the chance to review the present album, I was familiar only withNorthern Adventures, but that was enough to make me keen to hear Undertones – and I haven’t been in any way disappointed by it. 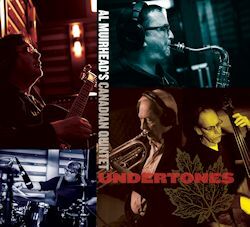 Undertones is, in a sense a specifically ‘Canadian’ album: Muirhead’s tune ‘Takin’ It To The Bank, Tom’ was written in honour of pianist Tommy Banks, one of Canada’s finest jazzmen and a long-time friend of Muirhead’s, who died in January 2018, just a few weeks before this recording was made, and all five players are Canadians. Undertones carries a subtitle ‘The Art of the Bass Trumpet’, which is the instrument Muirhead plays throughout. Jazz musicians who have regularly soloed on the bass trumpet are uncommon – only two (Cy Touff and, in Latin jazz, Willie Colón) come at all readily to mind. The sound of the bass trumpet is very like that of the valve trombone and Muirhead gets a beautifully smooth and rounded tone from the instrument, playing it with a fair degree of agility (notably on ‘Four Brothers’). Muirhead’s work on ‘Rose Room’ and ‘Charade’ is especially fine, with an attractive delicacy on an instrument that can easily sound cumbersome, but he is impressive throughout, his solos being lucidly structured without the loss of a sense of spontaneity. If one talks of Muirhead’s playing in terms of ‘weight’, it should be with reference to its freight of emotion rather than its sound. The rest of Muirhead’s Quintet are far from being slouches either. I was particularly taken by the guitar of Reg Schwager, simultaneously intelligent and fluent in solo, judicious in accompaniment. I already had a favourable opinion of bassist Neil Swainson from other recordings I had heard and he does nothing to disappoint here. All in all, this a fine, rewarding album; from the ensemble bounce which opens ‘A Tune for Cal’ to the closing bars of ‘Four Brothers’ one’s interest is firmly held, with music which offers interest for the foot (as in the tapping thereof), the heart (in terms of emotional expression) and, indeed, for the soul (the honesty and inherent joy in the playing is uplifting). The group’s reading of ‘S’posin’ would, in itself, be enough to make a strong case for the quality of contemporary Canadian jazz. If you enjoy intelligent, swinging jazz, deeply rooted in the mainstream, but with some unexpected sonorities (that bass trumpet again), this is for you!